Designed for a great mixture of speed and spin, as well as exceptional comfort and balance, the Butterfly Marcos Freitas MFX4 table tennis bat is an advanced choice for players with already established high skill in the sport. It boasts a concaved handle style for added speed and more aerodynamic feel, making each smash count and cut through air smoother. The bat is designed with a 5-ply wood blade to provide a solid feel, and each side of the blade is covered with red and black Pan Asia ITTF (International Table Tennis Federation) approved rubber that offers proper bounce and more responsive feel on each shot. The bat combines good control with extra spin and proper shot speed, and there is a special protective edging tape to ensure extra safety from minor impact damage, plus the bat is endorsed by Marcos Freitas – a European champion table tennis player from Portugal. 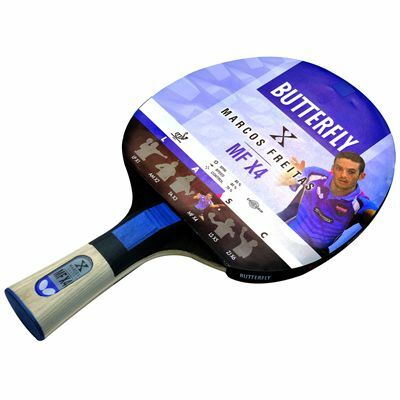 for submitting product information about Butterfly Marcos Freitas MFX4 Table Tennis Bat We aim to answer all questions within 2-3 days. for submitting product information about Butterfly Marcos Freitas MFX4 Table Tennis Bat. We aim to answer all questions within 2-3 days. If you provided your name and email address, we will email you as soon as the answer is published. for submitting product review about Butterfly Marcos Freitas MFX4 Table Tennis Bat.